Thirty three year old spinster, Soyoung, has an unbelievably young looking face! Most girls who are 33, they are either married or very successful in their field. However, all Soyoung has is a troublesome family, morass of poverty, a poor academic background and a baby face inherited from her dad. When you are young, you dream big. She, wanted to be a world famous designer, applied for the nation’s top reputed design school and got accepted. However, because of some complicated family matters, she has to give up on her dream school. Instead, she goes to a textile institute and graduate there at the top of her class. Moreover, her dexterity allows her to make simple clothes for herself. When economy worsened, she gets fired from a company she worked at for 13 years because of her age. Soyoung lies about her age to get a job at the top textile company! There, she meets Choi Jinwook who finds older women unattractive. Jinwook, not knowing Soyoung is 6 years older than him, is becoming fond of her..
Korean drama of the week "Ghost - Drama"
Choi Daniel cast for "School 2013"
Drama of the week "Babyfaced Beauty"
[Spoiler] Added episode 20 captures for the Korean drama "Babyfaced Beauty"
Will "Miss. Ripley" win back first place from "Babyfaced Beauty"? [Spoiler] Added episode 18 captures for the Korean drama "Babyfaced Beauty"
"Babyfaced Beauty" unsteady first place with 0.9% gap with "Miss. Ripley"
[Spoiler] Added episode 17 captures for the Korean drama "Babyfaced Beauty"
[Spoiler] Added episodes 15 and 16 captures for the Korean drama "Babyfaced Beauty"
"Miss. Ripley" chases after "Babyfaced Beauty"
[Spoiler] "Babyfaced Beauty" Choi Daniel wanrs Ryoo Jin "Don't touch Jang Nara"
[Spoiler] Added episode 14 captures for the Korean drama "Babyfaced Beauty"
[Spoiler] "Babyfaced Beauty" Jang Nara lays Choi Daniel on her lap "You have pretty eyebrows"
[Spoiler] Added episode 13 captures for the Korean drama "Babyfaced Beauty"
[Spoiler] Added episodes 11 and 12 captures for the Korean drama "Babyfaced Beauty"
"Miss. Ripley" runs first place... close competition with "Babyfaced Beauty"
Added episode 10 captures for the Korean drama "Babyfaced Beauty"
[Spoiler] Added episode 9 captures for the Korean drama "Babyfaced Beauty"
Kim Hyun-joong reveals teaser for "Please"
[Spoiler] Added episode 8 captures for the Korean drama "Babyfaced Beauty"
[Spoiler] "The Duo" ends in first place, "Miss. Ripley" will it continue? 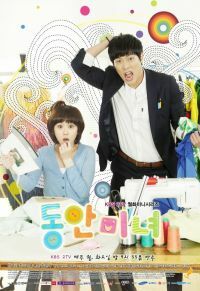 [Spoiler] Added episode 7 captures for the Korean drama "Babyfaced Beauty"
[Spoiler] Added episode 6 captures for the Korean drama "Babyfaced Beauty"
[Spoiler] Added episode 5 captures for the Korean drama "Babyfaced Beauty"
[Spoiler] "Babyfaced Beauty" Jang Nara is a home wrecker "I'm 34!!" [Spoiler] Added episodes 3 and 4 captures for the Korean drama "Babyfaced Beauty"
"Lie to Me" 10.4% two digit rate, "increase"
[Spoiler] Added episode 3 captures for the Korean drama "Babyfaced Beauty"
'Lie to Me': new spin on rom-coms? [Spoiler] Added episodes 1 and 2 captures for the Korean drama "Babyfaced Beauty"
[Spoiler] "Midas" ends with neck to neck rating with "The Duo"
Added poster, updated cast and pictures for the upcoming Korean drama "Babyfaced Beauty"
Choi Daniel, "I will get popular with pork hocks"
Added teaser and new stills for the upcoming Korean drama "Babyfaced Beauty"
Han Ye-seul comes back in a year and a half with "Spy MyeongWol"
Updated cast and pictures for the upcoming Korean drama "Babyfaced Beauty"
Debut 10 years Jang Nara, "Nothing has changed..."
Upcoming Korean drama "Babyfaced Beauty"
Jang Nara and Choi Daniel 'rendezvous' in KBS "Babyfaced Beauty"
View all 627 pictures for "Babyfaced Beauty"
Superb, shame it had to end.